The transformation of the grid has utilities crying foul (or fowl) because lots of customers using net metering reduces their balance sheet revenue. However, increasing evidence suggests that the overall economic benefits to the utility’s electric grid may outweigh the loss of revenue. Value of solar creates a market price for distributed solar energy in an effort to answer the utility’s cry. And Minnesota’s rigorous formula suggests that in crying “foul,” utilities may have been crying “wolf.” That’s because the initial estimates of the market value of solar peg it at more than the retail electricity price. In other words, utilities have been getting a sweet deal on solar power. Will Value of Solar Work? Will the value of solar market price be sufficient to maintain growth in distributed solar generation? Yes, according to preliminary calculations. The solar market price includes eight separate factors, but the largest four account for the lion’s share of the value: 25 years of avoided natural gas purchases, avoided new power plant purchases, avoided transmission capacity, and avoided environmental costs. The value of avoided fuel cost recognizes that utilities cannot buy natural gas on long-term contracts the way they can buy fixed-price solar energy, and it internalizes the risk of fuel variability that utilities have previously laid on ratepayers. The avoided power plant generation capacity value recognizes that sufficient solar capacity allows utilities to defer peak energy investments (like Xcel’s recently requested 3 natural gas peaking power plants that an administrative law judge discarded in favor of distributed solar). Avoided transmission capacity costs rewards solar for on-site energy production, saving on the cost of infrastructure and energy losses associated with long-range imports. The environmental value may be the most precedent setting, because it means that when buying solar power under Minnesota’s value of solar tariff, a utility is for the first time paying for the environmental harm it had previously been socializing onto everyone else. This value is based on the federal “social cost of carbon” as well as non-carbon externality values adopted by the Minnesota Public Utilities Commission. 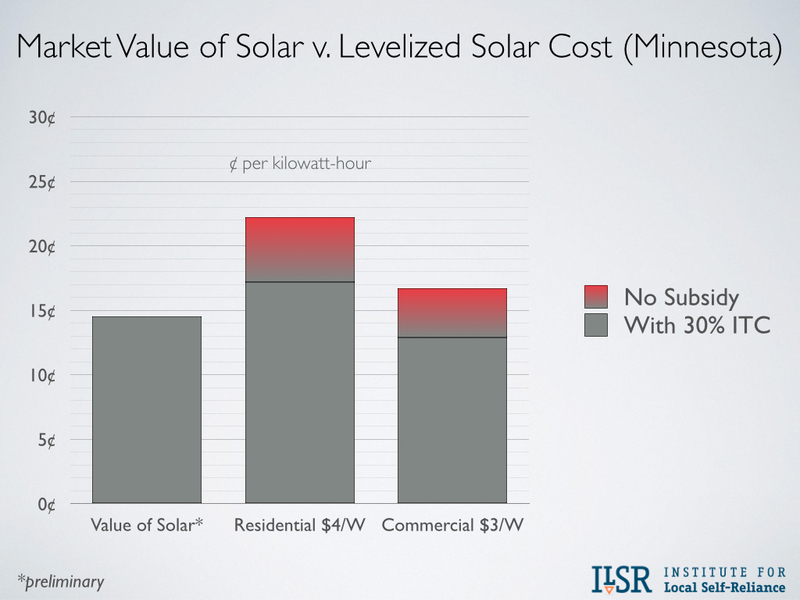 All told, the preliminary market value of solar estimate by Xcel Energy (14.5¢ per kilowatt-hour) for Minnesota comes fairly close to the levelized cost of energy from solar projects in Minnesota using the federal 30% Investment Tax Credit (ITC). Residential projects installed at $4/Watt will cost 17.2¢ per kWh over 25 years (and be eligible for state incentives). Commercial projects installed at $3/Watt will cost 12.9¢ per kWh over 25 years. 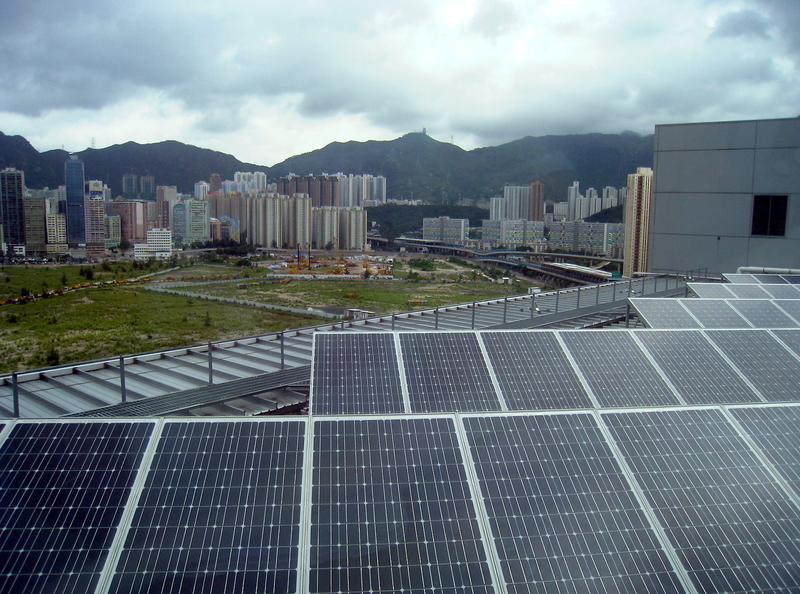 Will Utilities Adopt Value of Solar? The crucial remaining issue is whether Minnesota utilities will adopt value of solar in place of net metering. The adopted methodology may require utilities to (in the short run) pay more for solar electricity than they do under net metering. 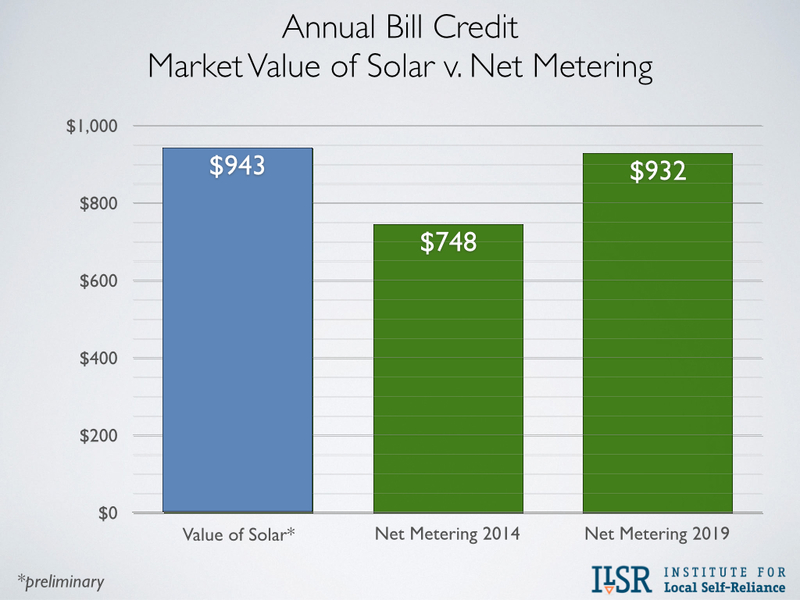 The following chart shows that a representative residential customer with a 5 kW solar array would net an extra $200 bill credit this year with the value of solar than they would using net metering. Within five years, however – based on recent utility rate inflation of 4-5% per year – the premium falls to just $12. And over the life of the value of solar contract – 25 years – the net present value (5% discount rate) of utility payments for solar production is $3,000 less under value of solar than under net metering. Not only that, utilities lock in the market value of solar when the signed a 25-year contract, not bad for a business rocked by volatile fuel prices. 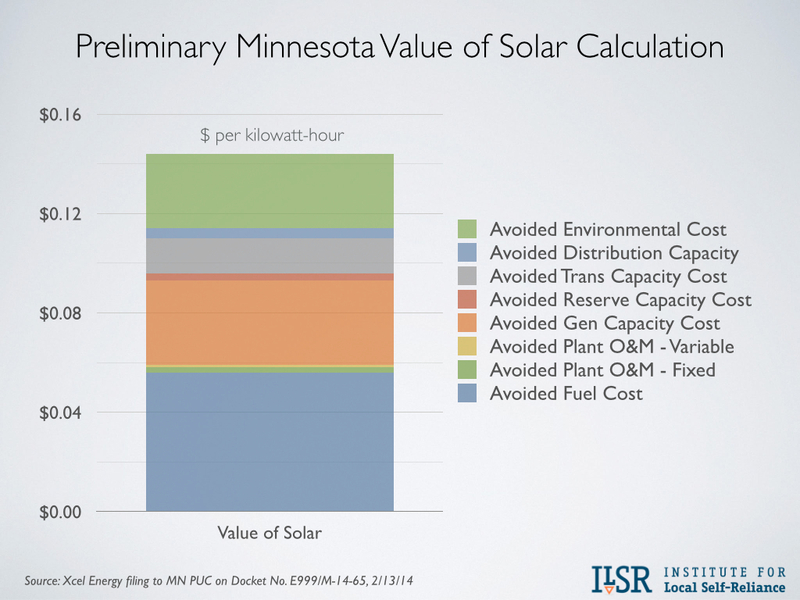 In theory, everyone is a winner if utilities adopt Minnesota’s market value of solar. In the near term, solar energy producers will get a better price than they have under net metering. In the long term, the cost of solar will fall (perhaps significantly) below the market value (accelerating the development of solar energy), and the 25-year, fixed price contract will help small-scale producers secure financing. Utilities should also come out ahead. Over the 25-year life of solar projects, they will pay less for solar energy than under net metering. Furthermore, greater amounts of solar on the grid will (over time) erode the market price for solar energy since much of its value is based on low (zero) fuel costs and environmental advantage over fossil fuel generation. The market value of solar should also be a victory for ratepayers. First, it’s transparent and without subsidy. In fact, it removes hidden subsidies for polluting fossil fuel generation. Ratepayers also get to purchase this renewable resource based on its value to the grid and not an awkward and obscure retail price proxy. Is the market value of solar the best thing to come out of Minnesota in 2014? 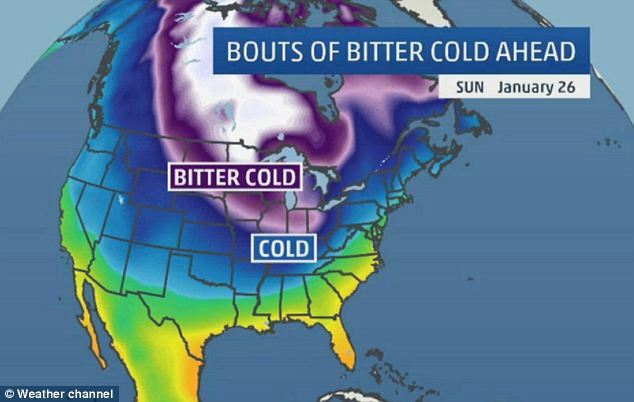 If nothing else, it beats the polar vortex. 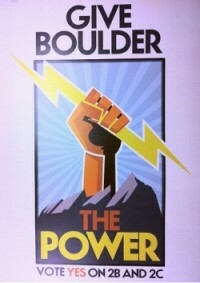 I’m seeing a great SPI session here: How the Value of Solar Can Changes America’s Utility Landscape. It’s on you, John. You write great pieces as always but this is really a standout. Best value of solar explainer so far. Bravo John, this was such a pleasure to team with you. 1. The first MW of solar install is the most valuable, but as the level of solar rises to a substantial fraction of the installed capacity, many of the savings identified in the study cited by Xcel will decline or disappear. For example, at some point the daily peak shifts from mid-day to the early evening, at which point increased solar is no long contributing to reducing capital investment in generation plant or wires. 2. The reduction in such capital investments even for the first MW of solar is location-specific. If solar is not highly reliable, there may be only a modest reduction in the investment in backup generation. By contrast, areas with excellent summer insolation can achieve substantial reductions here. Likewise, it takes a careful study to understand the impact on the distribution system costs. In some areas, substantial investments may be required to support the flow of power out from houses on older distribution systems that were built under the expectation that power would only flow in one direction (from the transmission substation to users). 3. Fuel costs vary from location to location and by time of day. In most of the US the value of the displaced wholesale power can be determined directly from the web site of the appropriate Regional Transmission Operator (the Midwest ISO, in Minnesota). Even allowing for all this, we still have to ask ourselves, “what is the value of the grid?” Should a household that generates as much power as it consumes pay nothing towards maintaining the grid, even though it is using that very grid to sell surplus power during the day and buy power during the night? The answer clearly must be that all grid-connected users should pay a fair amount to support that optionality. After all, if you drive across a toll bridge, and then drive back, you don’t get a rebate on the toll you paid earlier, even though you ended up in the same place you started. We need to find a retail tariff structure that simultaneously encourages the development of economical distributed resources AND maintains a healthy grid with fair pricing for all. 3. Absolutely. Grid fees are fixed. 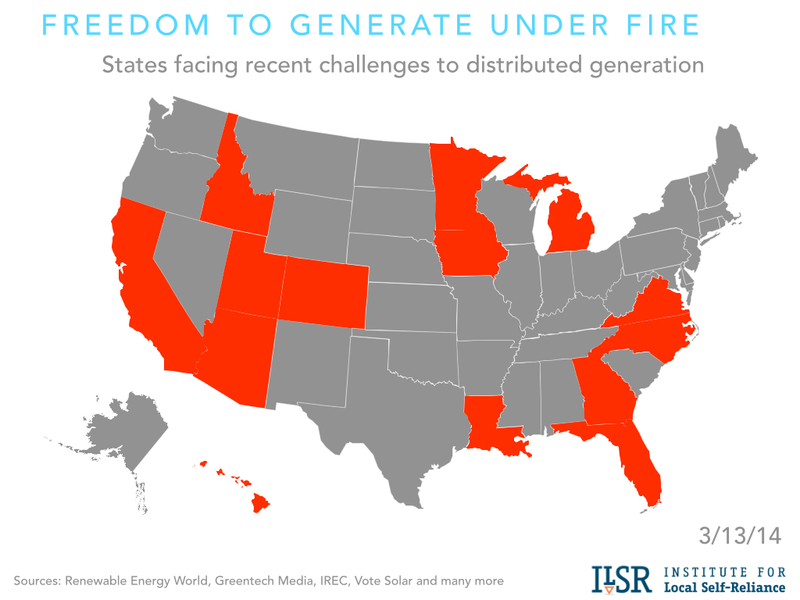 Solar users, like all users, should pay fixed grid fees. A solar user doesn’t use more grid than a regular user. In fact, their local grid services warrant a discount, ergo an honest solution to grid maintenance offers no penalty to solar users. Compare that to utility proposals. New pricing resulting in disproportionate price increases for solar customers is a scam. I support utilities that want to cost out grid fees on customer bills. They can also explain why this issue wasn’t worthy of their lobbying efforts when they were profiting from an over reliance on a consumption based rate structure. Maybe customer refunds are in order. Karl Rabago told me an interesting story that I’ll feature in an upcoming podcast. He asserts that there’s no reason to accept the utility argument that fixed costs on the utility system require fixed fees on customers, and his example is a coffee shop. If they accepted the utility model, there would be a $10 cover charge to go in, and a 25¢ cup of coffee. Utilities should structure their tariffs to achieve socially useful goals (e.g. conservation, peak load management) while covering costs. There’s nothing holy about fixed fees. As an economist, I have to disagree with Mr. Rabago. If fixed system costs are loaded into variable charges, then the prices faced by consumers are wrong. Wrong prices lead to suboptimal decisions. In the case in point, loading the costs of maintaining wires (a quasi-fixed cost) into the variable energy usage makes options like installing solar panels, replacing appliances, etc. appear more economical than they are from a social perspective. Some restaurants do indeed use the “fixed charge” pricing method — prix fixe menus are very popular in some countries. The analogy is poor, though, because restaurant capacity isn’t a public good (or not much of one). A robust electric system is a classic public good; it is also an interesting example of a network. Charging for network access is often done on a fixed-price basis, e.g. your internet bill doesn’t vary depending on actual usage, but rather on the quality of service you request. Telephone charges are evolving away from per-minute charging towards a fixed-price model. So, when networks and public goods are involved, the fixed-charge model does seem to dominate. I appreciate the thoughtful reply and I think what you say about “wrong prices lead to suboptimal decisions” sums up a lot of the challenges with developing distributed renewable energy and shifting away from polluting power sources. It seems to me that the trick is trying to dis-aggregate the “network cost” (i.e. the value of being grid connected) from the expenses associated with ill-fated investments in potentially stranded transmission or fossil fuel power plant assets that should be abandoned.